Manborg is described as a cult classic in the making, having seen it I must say I agree. The film was made to look like an old 80's style straight to VHS (remember those?) sci-fi film. Manborg takes place in an apocalyptic future where Nazi demons led by Count Draculon have invaded Earth from Hell. During the human/demon wars a young soldier is killed by Count Draculon after trying to avenge his brother. Many years later he awakes...as Manborg; a cyborg warrior intent on stopping Count Draculon and his hellish forces once and for all. I have not laughed so much in a long while, I did not expect this film to be good at all. Filmed on a budget of $1000 it was purposely made to look terrible by director Steve Kostani. I thought that the film was going to be boring but it was actually very good. What the look most reminds me of is the game Mortal Kombat, everything looks like it is filmed against a green screen, with what I imagine is very little actual sets. The majority of the film is CGI with fantastically bad claymation effects also used (usually when a demon is shot or attacked). Manborg felt very much like a videogame. The four main characters that make up the film are all brilliant. 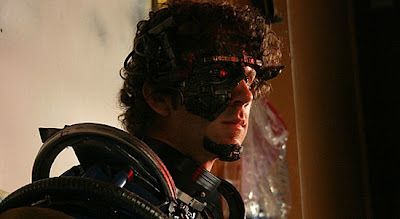 Manborg (played by Matthew Kennedy) is a complete idiot unable to control his cybernetic weapons, speaking in a booming loud robotic voice, and completely socially inept walking everywhere to beeps and whirs. #1 Man (Ludwig Lee) is an Asian warrior who looks like a character right out of Mortal Kombat, always straight faced and with a completely dubbed deep, deep voice. Justice (Connor Sweeney) is a brash, very cocky kid who wields a pair of pistols, lastly is Mina (Meredith Sweeney) an expert with throwing blades. The rest of the films characters for the most part are demons who are a mix of masks, prosthetics and claymation. Very pleased to see no CGI characters, everyone is refreshingly real (well, real or plasticine). All the characters are played completely over the top with terrible acting, especially physical over acting (a scene where Manborg looks shocked springs to mind). The script truly stinks but works so well because it does not take itself seriously. To paraphrase some dialogue 'Hey Bro, it's me, your brother, I died at the beginning. You did well, your a true hero...there's no heaven' May not mean much out of context but in the moment I nearly spat out my drink laughing! Manborgs plot is simple but works well as a result. 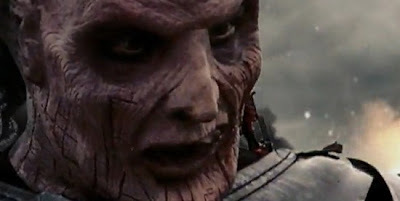 After a great introduction Manborg wakes in a demon controlled megatropolis of the future where he is captured and made to fight demons in an arena. The use of CGI for everything means there are some great (terrible but great) locations with some fantastic demons. Fight sequences are fast and fluid (again reminding me heavily of Mortal Kombat, and also the ITV show Knightmare) while a bike chase is a particular highlight. It would have been so easy for the film to get lost in itself and turn boring and overlong, but at 70 minutes it is fast paced but also giving a solid show. A great look, and also a very good soundtrack that recreates the 80's vibe well. People often say something is so bad that it's good. This is something that really tries to be bad, so bad that it turns into one of the best films I have yet seen this year. 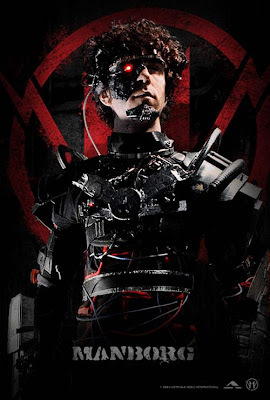 Manborg is now out on DVD and features a very funny fake trailer after the film for a feature called 'Bio-Cop'; a zombie cop who cannot die; well worth watching the credits to get to.